Imagine waking up to the sight of lush greenery covering the mountainsides in the distance. The creek below your private mountain cabin makes the scene feel peaceful and serene, and you enjoy your morning coffee relaxing on the deck as you take it all in. Your day ahead is filled with exciting adventures, and you get to retreat back to your private Pigeon Forge cabin when you’ve had your fun. Sound like a dream come true? Then it’s time to book your stay at Up the Creek! This Pigeon Forge cabin is a shining star of luxury, privacy, and relaxation. When you book your stay in this two-bedroom cabin, you can expect amenities such as a private four-person hot tub, an indoor Jacuzzi in the master bath, a media area with video games and a pool table, and so much more. The cabin is completely modern with Wi-Fi, multiple TVs, and a fully equipped kitchen so that you can cook up your favorite dishes (just bring food!). This family-style retreat has everything you need to enjoy a wonderful summer vacation – and what a view! The beautifully dense forest, the mountain peaks, and the creek right outside all make for a spectacular memory. 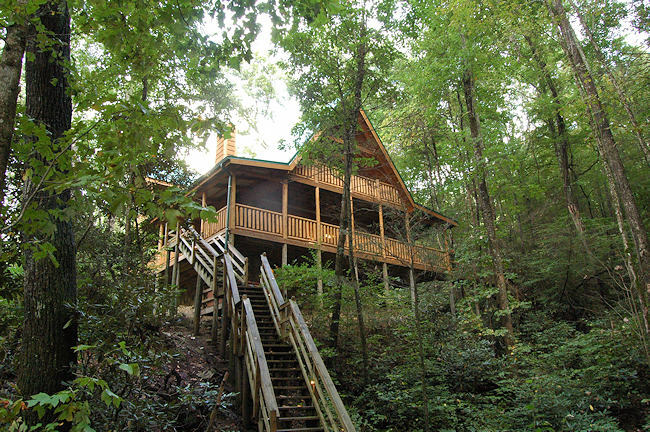 Remote, Yet Close to All the Fun – This Pigeon Forge Cabin Has It All! Up the Creek is located in a unique spot that gives you the best of both worlds. While you get a lovely remote getaway to relax in, away from traffic or city views, you are still only minutes away from downtown Pigeon Forge. Here, you can check out some of the most famous attractions in the area. Have a fun day at the Dollywood theme park, or check out some of the famous dinner theater shows. From shopping and fine dining, to exploring the great outdoors at the Great Smoky Mountains National Park, there is something for everyone in this beautiful area. Our cabins in Pigeon Forge are located near all the best attractions in the area, and Up the Creek is no exception! You’ll be able to head into the city for all sorts of fun, and then go right back to your very own oasis whenever you like. This cabin sleeps up to six people, and is perfect for a small family or a pair of couples – or just a single couple that wants to entertain during their stay. To book your stay in this or one of our other lovely cabins in Pigeon Forge, be sure to check out the available dates on our website today!